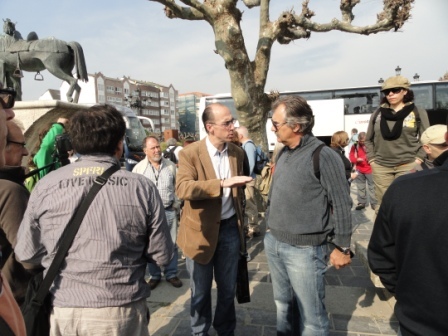 The start of a truly spectacular day greeted our 80 participants last Saturday morning at around 7.00 a.m., when we got underway for the 7th Sector from Baiona to Seixo (Vigo) following the coastal route. This time, rather than going through Caminha (closer to the coast) on the Portuguese border to hook up with our walk, we went straight north through a quicker route inland via Valença do Minho to get to Baiona. Valença do Minho is a particularly beautiful fortress town boasting a magnificent castle (built in the XIII Century) overlooking the Lima River into Galicia, Spain where our forever thoughtful organizers, Terra Verde, allowed us a stop for the traditional second breakfast. Once on our way, we reached Baiona (in the province of Pontevedra) in around 1/2 an hour where we were all asked to walk straight to the beautiful Santa María de Baiona Church (also built in the XIII century) where the parish priest was waiting to hold a small prayer in our honour. 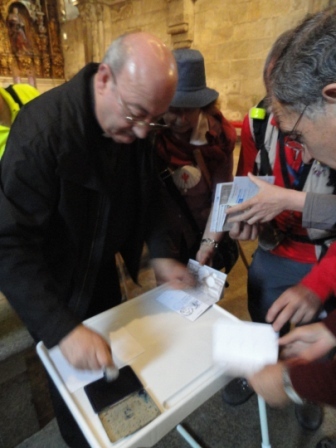 Following this he donned the role of Credential stamper giving us all the special Santiago walk church stamp. The Santa Maria de Baiona Church is of a Romanesque style and had the category of collegiate church from 1482 to 1850. It is divided up into three naves with the main nave resembling the Cistercian style of the Santa Maria de Oia monastery that we had previously visited. There is a beautiful Romanesque rose window in the upper main façade which can be admired from the pulpit area. Following this we quickly made our way to the foreshore close to the magnificent Monterreal Fortress (dating back to the X Century), where we were formerly greeted by the local mayor of Baiona, Sr. Jesús Vásquez Aluiña who officially welcomed us to Baiona, wishing us a safe journey and after taking the usual group photo, we were all given a goodie bag to take away with a stack of tourist information on Baiona. We felt very honoured that both the local mayor and priest went out of their way to welcome us to their region and wish us a safe ‘camino’! As usual we were accompanied by our fellow Galician Santiago pilgrims Luíz and António who guided us through historical Baiona, along very narrow cobbled streets shadowed by beautiful old buildings, past amazing monuments until we reached one of the most beautiful Medieval-style bridges still standing in Galicia called the Ramallosa bridge. 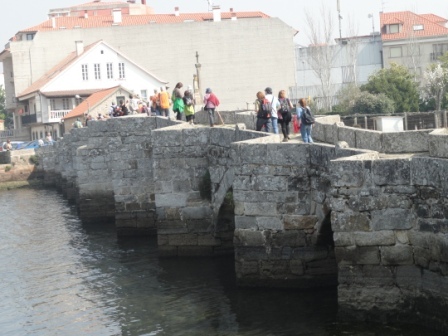 The bridge crosses the Miñor River, dividing the town councils of Baiona and Nigrán and is an amazing piece of architecture in itself. It presents 10 openings or bays with semicircular arches, eight of which belong to Baiona. Right in centre of the bridge is an image of Saint Telmo, the sailors’ patron and according to history it was them who ordered the cross. From here we walked into the coastal area of Nigrán where some of the most well-known Galician tourist beaches can be found: Playa das Americas among others. With the wonderful weather that we had, people, animals and nature were out in force and it was a pleasure just to enjoy all that was going around us. To reach our final destination of the small village of Freixo (close to Vigo), our walk took us along beautiful old Roman paths through forests covered in undergrowth. The walk closed in the late afternoon at the local community town hall which the parish had opened up especially and set up a magnificent Galician lunch for our group to include local wines all of which was a huge success. 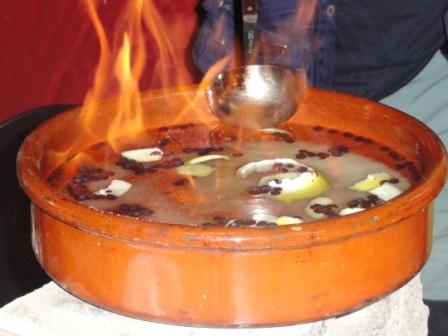 Two special treats were the highlights of the lunch – a ‘Queimada’ a ritual where Galician aguardente, a spirit distilled from wine and flavoured with coffee beans, sugar and lemon is burnt in an open clay pot. The goal of the preparation ritual is to distance the bad spirits that, according to tradition, lie in wait for men and women to try and curse them! A spell is chanted with all listening and we were all invited to stir the ‘potion’ twice to keep away the spirits! We all had the opportunity of trying the delicious potion at the end. 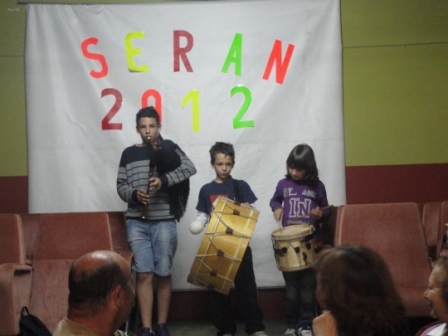 Following this, three children from the village performed local music with their instruments. This is fun to see as one of the traditional Galician musical instruments is a bagpipe called the Gaita Galego and the children really enjoyed themselves playing to us. In closing we said our goodbyes to our fellow Galicians and we look forward to the 8th sector where we will discover more about Vigo which during the Middle Ages was part of the territory of Portuguese speaking neighbouring towns. Vigo boasts a fascinating history where it suffered several invasions from Vikings, the English – Sir Francis Drake, the Turks and the French! We will also hook into the traditional Santiago route on the next sector which we have been told is very beautiful too. More to come…. Thank you again to our friends at Terra Verde for all their hard work in organizing this walk. This entry was posted in History of Portugal, Walking in Portugal, Walking in Spain & Portugal and tagged Photography, Portuguese Food, Religious walks, Rich Traditions, Santiago de Compostela, Spanish History, Walking in Spain & Portugal, Way of St. James. Bookmark the permalink. Delighted to help out! Let me know an email to contact.